Located in the Supreme Court room, this geological portrait by H.L.A. 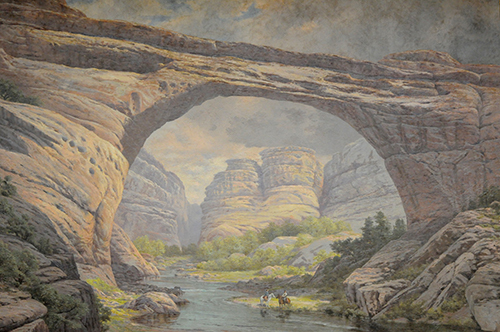 Culmer depicts Caroline Bridge, one of three magnificent natural bridges located in southern Utah’s Natural Bridges National Monument. This bridge boasts a span of 210 feet, making it one of the longest natural bridges in the world. When prospector Cass Hite encountered the bridges in 1883, he originally named them President, Senator, and Congressman in order of height. Another expedition in 1903 renamed the two largest bridges Augusta and Caroline. When H.L.A. Culmer traveled to the area as an artist and surveyor in 1905, he renamed the smallest bridge Edwin, in honor of the expedition’s organizer Col. Edwin Holmes. Culmer photographed and painted all three bridges, and Col. Holmes initially kept the paintings in his private collection. National Geographic publicized the bridges and Culmer’s paintings in 1907, and the area surrounding the bridges was designated as a national monument in 1908. Today, the painting of Augusta Bridge, now known as Sipapu Bridge, hangs in the Governor’s ceremonial office; the painting of Caroline Bridge, now known as Kachina Bridge, hangs in the historic Supreme Court chamber of the Capitol.